Today most people with all age range across the world is familiar to delicious chocolate brownie cups, they love the chocolate brownie and also brownie cup (mini size). Brownies are recognized as a one type of dessert introduced at the USA at the late of the 19th century which is rapidly gain huge popularity and fan in US as well as Canada throughout the initial part of the 20th century. It is like a broad cookie as well as a hard to chew cake. Normally the brownies shape are a horizontal, arid rectangular cube or slab. Brownie Cups not hard to do, so go ahead ! The quality of the chocolate is important, the chocolate should have a high cocoa solids content. I quite like to made it with chocolate over 85% cocoa solids, but the family say that is quite bitter and they won’t like it so a high percentage of cocoa solids present in dark chocolate should be over 70%. Heat oven to 350 F. Arrange 18 muffin cups with paper or foil bake cups. Place batter in large microwave-safe bowl. Microwave at highlevel 1 ½ minutes or until melted. Stir in Sugar and vanilla. Add eggs; beat well. Add cocoa; beat until well blended. Add flour, baking powder and salt; beat well. 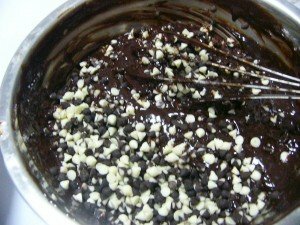 Stir in 75 g Chocolate chips and 75 g White Chips and 75 g Chopped nuts. Bake 25 to 30 minutes or until surface is firm; remove from oven. Immediately sprinkle remaining 50 g Chocolate Chips and 50 g white chips and 50 g chopped nuts over muffin tops, pressing in slightly. Cool completely in pan or wire rack. Some people like to eat brownie by topping it with sprinkles, sugar, as well as occasionally with ice cream. Even people love to serve it warm topped with the vanilla ice cream and nuts. 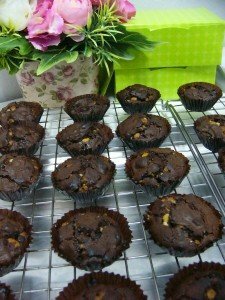 It is possible to made the brownie cups at home also.